very ruffled. Leaves are held up on purple petioles. Matures to 14" tall x 18" wide. sport of 'Abiqua Moonbeam'. It has thicker leaves ​with a much wider gold margin. Eagerly awaiting this one to become mature in the garden. Shiny green leaves with yellow margins which will pale through the season. The very large thick leaves are held upright as they emerge and form a massive mound when mature. A real giant at almost 3 feet tall by over 6 feet wide. green margin. Leaves are held red petioles that bleed in to the base of the leaves. A vigorous grower! Matures to 14" tall by 30" wide. A very impressive sport of ‘Captain Kirk’. coloring that jets toward the center. I can't wait to see this one come spring. Wavy, heavily rippled blue leaves form a medium sized mound. Foliage has a heavy substance. Matures to 14" tall by 32" wide. ‘Wave Runner’ is a large sport of ‘Squash Casserole’ with chartreuse green foliage and a wide and heavily rippled, yellow margin. Foliage is slightly corrugated and measures 12” by 8”. Medium to fast growth rate helps produce a plant nearly 5 feet wide. Another favorite rippled variety of mine. 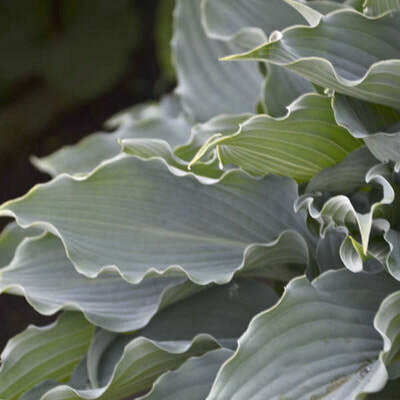 This adorable little hosta has extremely wavy green leaves with creamy white margins. Leaves have a thick substance so offer great slug resistance. Forms a showy mound 12” tall by 28” wide. pointy leaves are held upright, forming a wavy mound of foliage that changes throughout the season. The leaves have dark green, streaked margins with greenish veining in the creamy white centers in spring, turning light green, then finally dark green by late summer. Grows 20” tall by 40” wide. A tissue culture sport of 'Whirlwind'. Thick substanced leaves with a dark-green margin and creamy white center turning to pure white for most of the season. Emerges white in the spring then develops green along the veins and speckling between the veins, and finally turning all green. A gold-edged sport of 'Blue Mammoth'. Corrugated foliage that offer good slug resistance. 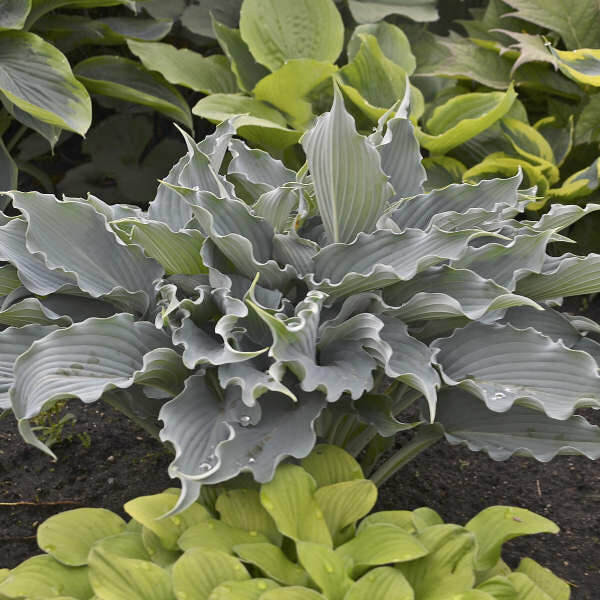 Matures to 24" x 60"
‘Wide Brim’ is an all-around great hosta and sure to stand out in any garden. It forms a pretty mound to over 3 feet wide of dark green leaves with a wide, irregular margin that is creamy yellow. Good growth rate and does well in full shade to ¾ day of sun. Bright yellow foliage that is long and thin with incredibly wavy margins. ​good bright yellow color. Matures to 10" x 24"
forms a small mound of green foliage with a creamy white margin. 'Sum and Substance'. This hosta has a sprawling habit and grows to 33" tall by 80" wide. Leaf size measures16" x 12"
This beauty holds its blue color long in to the season. Its huge leaves are cupped, rippled and textured and unfold slowly as they mature. Grows to 23" tall by 38" wide. ​This variety has attractive, contrasting, 10 “long, wavy blue foliage with a wide gold margin. In our opinion, one of the best mini’s introduced. This easy to grow variety becomes a compact mound 5” tall by 15” wide of medium green leaves with a very thin white to creamy-white margin. The foliage is slightly wavy and cupped. leaves that are 14” long by 10” wide. grey-green overlap where the two colors meet. A vigorous grower. ​Matures to 9" tall by 29" wide. blue-green leaves with striking apple-green margin, as well as good substance. Matures to 3 - 4 feet tall by 4 feet wide. and a narrow dark green margin. Has fairly fast growth rate. of thick, wavy blue-green foliage. A vigorous grower. Shows good sun tolerance in my garden. Matures to 20" x 50"
gold foliage that measure 4" x 2". What can we say, It's gorgeous and a sport of 'Striptease'. This is it's spring foliage. Margins will darken as the season progresses. Matures to 9" x 17"
matures to an impressive 30" tall by 60" wide. can grow to 12” tall by 30” wide.